Ecclesiastical authority was already a major issue of debate during the fourteenth century. These challenges, much like the rise of the Papacy itself, came in small movements that built to a climax during the Reformation itself. These challenges to the papacy set the stage for Luther. There were a number of factors that contributed the weakening of the Papal office. There was the untimely deaths of a series of popes, which lead to a lot of turnover at the helm. There was also massive papal debt, as a result of the crusades. That debt led to conflicts between the Pope and the secular rulers, since the Church was attempting to tax the people while maintaining exemption itself from taxation. Then there was the “Babylonian Captivity.” When Pope Clement V was elected to the office, the French King refused to let him leave Avingon and go to Rome. For all his words of sovereignty, the Pope was actually a captive of France. There were also more bold voices challenging Papal authority. Marsilius of Padua, for example, wrote a treatise on government in which he declared that the church had no authority over “temporal affairs.” While his concerns were largely political, this treatise would be frequently cited in later theological debates. The “Great Western Schism,” however, was a serious blow to the authority of the Papacy. The papacy’s location in Avignon became an alienating factor to the rest of the empire. In part, because there was a massive building campaign to create ornate and beautiful palaces in Avignon, the money to support this campaign, however, was coming from serious taxation. Critics attacked the church accusing it of fleecing the sheep, instead feeding them (John 21:15-17). There was a strong call to return the church to Rome, which was heeded by Pope Gregory XI in 1377. But Gregory XI died a year later and he was replaced by Urban VI, another pope with ties to the French (he was an administrator of the Avignonese curia). The people, in fear that the Papacy would be returned to Avingnon, rioted in the streets. Whether the Cardinals who appointed Urban VI felt pressured or simply regretted their decision is not clear, but they met again and determined that Urban VI’s election was invalid. Instead, they appointed Clement VII to replace him. Naturally, Urban VI didn’t take this too well and he refused to step down. Each “Pope” excommunicated the other. The Schism was a massive challenge to the integrity and supreme authority of the Papal office. In fact it was of such massive import that it sent tremors throughout all of Christendom. It “called the sacred basis of existence into question to an extent hitherto unknown” (Oberman, The Dawn of the Reformation, 22). When the Reformation of the 1520s created a literature of abuse against the Order of the friars and portrayed them as the prime representatives of the old corruption, one of the reasons that these bilious pamphlets were so effective was that the massive readership found much that was familiar in the insults on the page. So, it is important to realize that much of the anticlerical rhetoric which became an integral part of the Reformation was actually the product of long-standing disputes among the clergy, rather than spontaneous lay criticism of their faults. While not directly focused on the Pope, these critiques added to the mounting uncertainty about the spiritual leadership and organizational structures of the church. The issue of shepherding was a point of major concern for many, and that spanned from Parish Priest all the way up to the Pope himself. When a Pope like Julius II (1503-13), who became known as the “Warrior Pope,” spent more time building and leading armies than shepherding the church it seemed that there was good reason for concern. The Reformation came at a time when major concerns were rising throughout Christendom. We need to acknowledge this and wrestle with it. 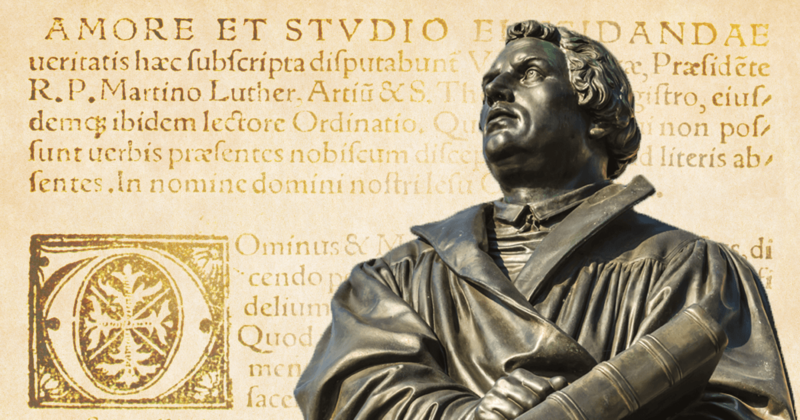 The simplistic reading of the Protestant Reformation suggests that Martin Luther came to a completely fresh perspective on Scripture, on soteriology, and ecclesiology and birthed a more pure church as a result. This is neither true nor helpful. It may be an inspiring story, but it does nothing to actually help Christians wrestle with the contexts in which they live. The reformers, all of them, were the products of their time, likewise the reformation was a result of its time. God may interject His will miraculously and suddenly into history, but often He works through the ordinary means of people, cultures, and times. Knowing the context of the Reformation allows us to appreciate this and seek to engage our own culture and time for God’s glory. We don’t sit idly by waiting for God to dramatically alter the course of history. We work to bring Him glory in the midst of it.